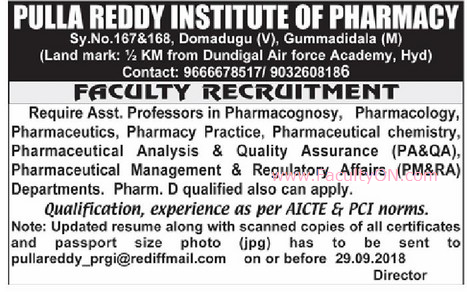 Pulla Reddy Institute of Pharmacy, Hyderabad has advertised in the EENADU newspaper for recruitment of Assistant Professor jobs vacancies. Interested and eligible job aspirants are requested to apply on or before 29th September 2018. Check out further more details below. About College: Pulla Reddy Institute of Pharmacy was established in the year 2007. It is governed by Gayathri Educational Society. The Society was established in the year 2004 with the motto to provide Quality Education to the economical and geographically underprivileged population. College established in the year 2007, with B.Pharmacy course. Then started M.Pharm (Pharmaceutics) in 2011-2012, pharmacentical analysis in 2012-2013 and pharmacentical regulatory affairs in 2014-2015. Also started pharam-D programme(6 years duration)in 2012-2013. How to Apply: Interested candidates are requested to send their updated CV along with scanned copies of certificates and recent PP size photo (jpg) to the email address provided below.